The present work deals with isomerization of straight chain paraffin, n-hexane with an aim to make up loss in gasoline quantity as well as octane. This is due to its reduced benzene content warranted by its carcinogenic nature. Performance of impregnation of alkaline earth metals (Mg, Ca, Sr, and Ba) on Pt/desilicated (and dealuminated) zeolites Beta was studied and found that isomer selectivity as high as 99% with stable catalytic performance is achievable. Furthermore, replacing part of hydrogen (15%) with carbon dioxide in hydrogen as carrier gas improves hexane conversion. Hexane conversion increased as Mg–< Ba–< Ca–< Sr–Pt/deSi Beta. Observed performance parameters have been explained on the basis of reported variation in acidity due to both alkaline earth metals and CO2. Importance of isomerization of the straight chain paraffins (chiefly C6–C8 for gasoline) and C11–C16 for diesel) needs not be overemphasized in light of environmental/health issues and requirements of fuels’ desired physical properties. 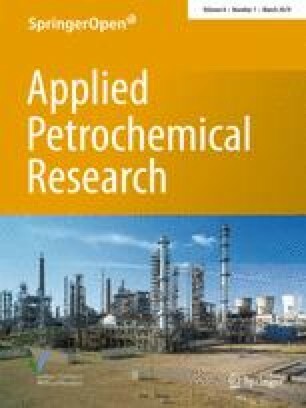 Products of the isomerization reaction, branched paraffins (iso-alkanes), enhance octane number of gasoline and improve the cold flow properties of diesel. In addition, this research area has so amply been explored by numerous researchers that it has almost reached the stage of platitude. Briefly, this reaction is carried out in presence of hydrogen, though there is no net consumption of hydrogen. As well-established reaction mechanism described for usually studied and commercially employed bifunctional catalysts comprises of the following steps. n-Alkane dehydrogenates to corresponding olefin which diffuses to acid sites in the neighborhood. At acid sites, olefin converts structurally and upon reaching the metal site it saturates to branched paraffin, though a little variation in this conventional mechanism has also been proposed . The metal function needed on the acidic catalyst has been widely reported to be imparted by Pt. Furthermore, on the basis of increased molecular size upon conversion, large pore zeolites attracted the attention of the researchers. Among the probable candidates, keeping hydrothermal stability of the catalyst in mind, zeolites Beta has remained the catalyst of choice. Readers are referred to relatively recent works [1, 2] for introduction to paraffin isomerization and review articles by Valavarasu and Sairam , and Akhmedov et al. for details and comprehensive intricacies of various commercial processes. Now, when the molecular size of product increases as a result of the reaction, it is worth expecting that (a) smaller crystal size, preferably in nanometer size affording smaller diffusion length and enhanced external surface area and (b) generation of mesoporosity in zeolites crystals would be beneficial for the reaction. Again, the readers are referred to a recent review article to apprise themselves on the potential of hierarchical porosity for host of hydrocarbon reactions, including isomerization . Furthermore, combined application of mesoporosity and nanocrystalline large pore zeolites Beta for isomerization reaction has also been exemplified . Thus, avoiding repetition of well-reported aspects of n-paraffin alkylation, we wish to explore for advantages in terms of improved isomerization selectivity, increased n-paraffin conversion, and enhanced catalyst life from two mutually unrelated aspects, though dealt with separately in distinct areas of hydrocarbon conversions. While our literature survey may not be exhaustive, we understand that the combination we sought to explore has been scantily, if at all, been reported. The proposed combination incorporates the application of alkaline earth-metal (Mg, Ca, Sr, and Ba)-impregnated Pt-desilicated zeolites Beta and CO2 as a carrier gas along with hydrogen for n-alkane isomerization reaction. The rationale behind choosing them is highlighted below. Esquive et al. report that the number of the medium–strong Brönsted acid sites reduces when the zeolite is exchanged with alkaline earth metals which was accompanied by generation of new Lewis acid sites, the strength of which reduces in the sequence, Mg > Ba > Na > K . Liu et al. showed the increase in number of acid sites of Pt–H-Beta zeolites as Mg < Ca < Sr < Ba. Lack of agreement in acidity pattern reported in references 6 and 7 should be noticed . Seddigi obtained decreased number of acid sites with higher acid strength (than that of zeolites HY) when the zeolites were modified with Ba . Maldonado-Hodar et al. ascribed higher catalytic activity to increased number of acid sites as well as strength of the alkaline earth-metal-supported catalysts . Very recently, Goetze and Weckhuysen compared the performance of parent and Mg impregnated ZSM-5 in the reaction of methanol to olefins . They showed a decrease in number of Brønsted acid sites along with creation of Lewis acid sites and attributed reduced coke formation to this decrease in number of Brønsted acid sites. Furthermore, on Mg–ZSM-5, ethylene and propylene were shown to be less reactive towards undesired aromatization. Similarly, Okado and Shoji also observed longer stability of the catalyst (Ca–zeolite and Sr–zeolite) in the methanol to olefin reaction , though migration of Ca while regenerating the catalyst was suspected. In line of the above studies, Sawa et al. also reported significant improvement in catalyst life after dealumination of and upon exchanging zeolites mordenite with Ba . In relevance to migration of Ca while regenerating the catalyst, Larin et al. mention that carbonates can form without much energetic barrier and oxides of Mg, Ca, Sr, and Ba will convert to corresponding carbonates . Summarily, one concludes that upon exchanging the zeolites with alkaline earth metals, acid sites (number, strength, and type) get altered, mostly to the benefit of the reaction at hand. In majority of the hydrocarbon reactions, hydrogen is used a carrier gas. However, a few researchers have also tried an acidic carrier gas, namely, CO2. Minachev et al. attributed increased activity of CaNaY for benzene ethylation in presence of CO2 to proton enrichment and increased number of active sites . Adsorbed CO2 had been shown to form monodentate carbonate structures, without altering the system acidity. In agreement this above conclusion, Upare and Lee showed enhanced acid strength when CO2 was present . CO2 has been mentioned to change the properties of supported metal clusters and thereby altering metal’s catalytic activity also. Mirodatos et al. advanced that acidic OH groups can be created upon CO2 adsorption and reducing the basic hydroxyls groups in Mg– and Ca–Y zeolites . This resulted in increased isooctane-cracking activity. The same research group mentions that a fraction of protons on zeolites is inhibited from the cracking activity due to basic Mg(OH)+ species . In the presence of CO2, the covered protons become available for the reaction, and in addition, new acid sites are also generated. This leads to higher catalytic activity. Similar trend has been shown to be valid for Ca–Y also and speculated to be good for other polyvalent ion-exchanged zeolites interacting with acidic gases. Thus, CO2 has also been found to play a favorable role particularly when the zeolites are impregnated with alkaline earth metal. In light of above-described observations, it was decided to study the performance of Mg-, Ca-, Sr-, and Ba-impregnated mesoporous zeolites Beta in H2 and 85% H2 and 15% CO2 as carrier gas in the reaction of n-hexane isomerization. The observations have been explained on the basis of reported relevant information. n-Hexane (Finar, 99%), chloroplatinic acid hexahydrate (H2Cl6 Pt. 6H2O) salt (Sigma-Aldrich), NaOH (Finar), NH4NO3 (Finar), Sr(NO3)2 (Sigma-Aldrich), MgSO47H2O (Finar), Ga(NO3)3 (Finar), BaCl2 (Finar), CaCl2 (Finar), and zeolite Beta (Si/Al = 30) (SudChemie, Baroda, India) were used. Prepared samples were characterized by X-ray diffraction (XRD), and scanning electron microscopy (TEM). Zeolite Beta was desilicated using 0.2 M NaOH aqueous solution (15 mL/g of zeolite) at 65 °C under stirring for 45 min. The sample was washed with distilled water followed by ammonium exchange with 10 wt % NH4NO3 solution (15 mL/g of zeolite) under reflux for 3 h. After repeating this procedure for two more times, the sample was washed and dried overnight at 100 °C. Resulting powder was calcined at 500 °C at a rate of 5 °C/min for 5 h under flowing air (50 mL/min). Zeolite Beta was dealuminated using 2 M HNO3 aqueous solution (15 mL/g of zeolite) at room temperature under stirring for 1 h. The sample was washed with distilled water followed by ammonium exchange with 10 wt % NH4NO3 solution (15 mL/g of zeolite) under reflux for 3 h. After repeating this procedure for two more times, the sample was washed and dried overnight at 100 °C. Resulting powder was calcined at 500 °C at a rate of 5 °C/min for 5 h under flowing air (50 mL/min). Pt was introduced into desilicated H-Beta by incipient wetness impregnation (IWI) method and this was followed by depositing an alkaline earth metal adopting the same IWI method . Pt content of each catalyst was 0.5 wt % and the metal content was 3 wt %. Each of prepared catalyst powders was dried at 110 °C overnight. 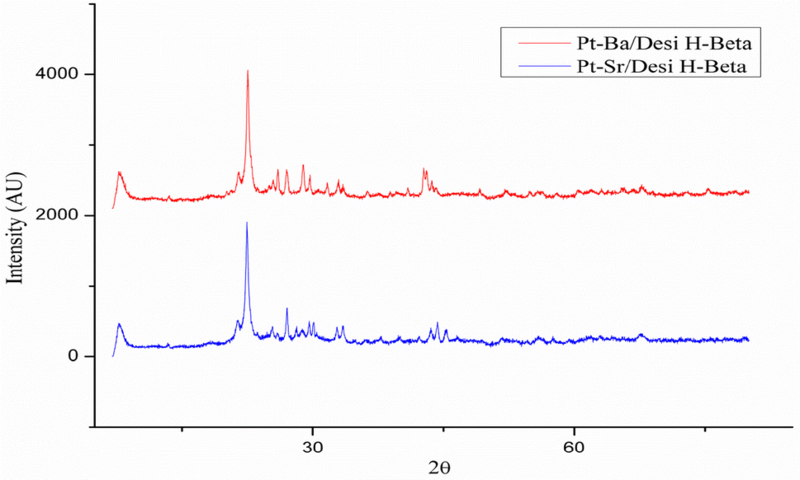 The dry powder was calcined in air at 500 °C heating at 5 °C/min for 5 h followed by reduction in hydrogen at 400 °C for 2 h.
Figure 1 depicting the XRD patterns of bimetallic catalysts (Ba–Pt and Sr–Pt/desilicated Beta) confirms that the crystalline structure of the parent zeolite Beta was retained. Peaks at 2θ values of 40 and 46 suggested the Pt cluster size of 4.8 and 3.2 nm, respectively. The same could be seen in the TEM images (Fig. 2) also. In Fig. 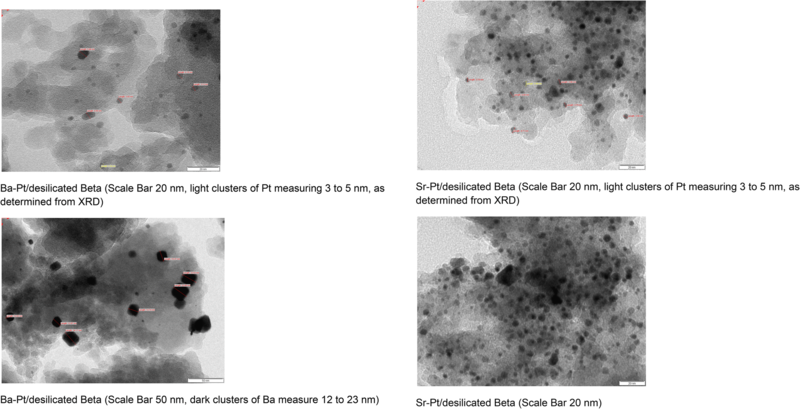 2, the TEM images of Ba– and Sr–Pt/deSi Beta, Pt clusters measuring 3–5 nm could be seen well-dispersed. In addition, relatively larger clusters of Ba and Sr (in oxide form) are seen uniformly distributed. Now, as is evident in “Introduction”, contradicting effects of alkaline earth-metal impregnation on total acidity, strength, and trends have been published. However, qualitatively, one finds that Brönsted acid sites reduce and Lewis acid sites increase in number. The latter are useful for isomerization reaction. Thus, as our objective was not to establish the acidity trend, we did not go for any acidity measurement technique. From our earlier experiences with hierarchical zeolite Beta for isomerization of n-hexane, we deduced the following operating conditions to afford the highest isomer yields: catalyst mass 1 g, n-hexane flow rate 6 mL/h, H2/hydrocarbon 2 mol/mol, pressure 1 atm, temperature 350 °C, and reaction in continuous down flow reactor . The present work is an extension of our previous efforts to increase the catalyst life and enhance the isomer selectivity. As mentioned in the “Introduction”, two mutually unrelated aspects have been combined in this study. In addition, it is known that Pt dispersion improves and hence catalytic activity when Pt is impregnated on alkaline earth-metal-exchanged zeolites. However, in our catalyst preparation method, the sequence of metal depositions is reverse, and still, we envisage an advantage with regard to prevention of Pt sintering while regenerating the catalyst to remove the coke deposition. Table 1 summarizes the operating conditions along with corresponding performance parameters. The addition of Sr on Pt/deSi Beta afforded much higher n-hexane conversion (80%, column 3) when 0.15 volume fraction of carrier gas, H2 was replaced by CO2 against 33% on Pt/deSi Beta with H2 as carrier gas (column 2). This enhancement in conversion is a combined reflection of conclusions (with regard to increased Lewis acidity and formation of acid sites due to the presence of CO2) discussed in “Introduction”. Furthermore, the enhancement in acidity/activity is so high that selectivity to the cracked product was registered to be 18%. Still, the drop in isomer selectivity was only about 7%. The trend observed for n-hexane conversion is Mg–< Ba–< Ca–< Sr–Pt/deSi Beta (columns 3, 7, 9, and 10) and that for isomer selectivity was Mg–< Sr–< Ba–< Ca–Pt/deSi Beta. In addition, Ca–Pt/deSi Beta was found to afford the highest isomer yields. Conversion sequence among these four metals was the same in the reaction of n-heptane isomerization reaction who reported Mg to yield the least acidic and Ba the highest acidic zeolites . This suggested order may not be convincing while going down the Group from Mg to Ba, and basicity increases or acidity decreases making Mg most acidic. In fact, Calatayud et al. had shown the basicity trend as BaO > SrO > CaO > MgO . In light of the observed mismatch between acidity and conversion values observed in the present and reported works may be lack of determination of proportions on alkaline earth metals, their oxides and their carbonates. Furthermore, as mentioned earlier, in the presence of CO2, formation of carbonates of these metals is facile . These carbonates impart additional acid sites to the zeolite support with MgCO3 having the highest acidity. Despite the expected acidity order, neither conversions nor selectivity matched with it. Role of total acidity and type of acidity become clearer when the performance of Pt/deSi Beta and Ca–Pt/deSi Beta is compared. The former furnishes the conversion (33%, column 2) which is less than that by the latter (47%, column 8). The corresponding selectivity values, respectively, are 80 and 93%. In addition, and importantly, Ca–Pt/deSi Beta presented stable catalytic performance in terms of conversion and selectivity for 5 h time-on-stream. The advantage of the presence of CO2 is evident from the fact that a mixture of CO2 + H2 affords higher conversion and isomer selectivity (67 and 96%, respectively, column 7) than that in the presence of only H2 (47 and 93%, respectively, column 8) over Ca–Pt/deSi Beta. Liu et al. obtained 61.7% n-heptane conversion and 95.4% isomer selectivity on 1.41 wt % Ba (calculated by us)/0.4 wt % Pt on zeolites Beta (their best performing catalyst) at 230 °C and the WHSV of 2.7 h−1 . Whereas in the present study, Ba–Pt/deSi Beta renders 51% conversion and 82% selectivity at 350 °C and 4.8 h−1 WHSV (column 10). Though these two observations as such cannot be compared, it is believed that the mesoporosity of the zeolite used and the presence of CO2 in this study to be responsible for relatively better performance even at contact time nearly half of that in the former study. Of course, reaction temperature is higher in the present work, and at higher temperatures, equilibrium concentrations of isomers decrease. Thus, the catalyst system employed in this study may outperform the reported one. Besides, experiments were performed using the dealuminated zeolites Beta. Dealumination results into fall in acidity. Earlier, it has been shown that Sr bestows enhanced acidity which is detrimental from isomer selectivity point of view. Thus, before impregnating zeolite Beta with Sr, it was dealuminated. Such treatment can be envisaged to raise the proportion of Lewis acid sites and decrease the Brönsted acid sites. This enhancement in Lewis acidity is reckoned to benefit the isomerization reaction. Thus, performance of Sr–Pt/deAl Beta was studied as a function of temperature (columns 4–6). As expected, this catalyst exhibited lower conversion (42%, column 5) than that by Sr–Pt/deSi Beta (80%, column 3) which is supposed to have higher acidity. However, the crucial balance of acid strength and metal function is attained in such a manner that the isomer selectivity as high as 99% (column 4) could be realized at slightly reduced temperature of 340 °C. Furthermore, in line with presumption, n-hexane conversion did increase (33–66%) with temperature and the isomer selectivity decreased by meager three point percentage (99–96%). In the case of dealuminated version of the catalysts, stable conversion was observed at 375 and 350 °C for 6 h time-on-stream (though not very large) which was not the case with desilicated version. Furthermore, the dealuminated version afforded stable and high (about 97%) isomer selectivity for the same duration of the time-on-stream at both reaction temperatures. Sawa et al. too observed improved catalyst life upon dealumination and Ba exchange of mordenite in the methanol to gasoline process . However, one can expect the much extended stable performance if the reaction was carried out at elevated H2 pressure. This is due to saturating the olefinic coke precursors. Variation in activity patterns of two different versions, deSi and deAl, may be due to higher acidity of the desilicated zeolite, which leads to formation of cracked products in which olefins (triggering oligomerization and subsequently coke formation) too would form. In addition to the advantage of increased catalyst life, another benefit that can be realized is from kinetics/mechanistic point of view. Isomerization of n-hexane to branched paraffins has been shown to benefit from the presence of an alkaline earth metal (in metal, oxide, or carbonate form) and presence of CO2 in H2 carrier gas. Ca–Pt/deAl Beta and Sr–Pt/deSi Beta were observed to afford stable catalytic performance with 96 and 99%, respectively, isomer selectivity. Authors are thankful to GUJCOST for financial assistance.